Designed for long-term use where economy is a factor, NHXH economy connectors are ideal for high-temperature applications. 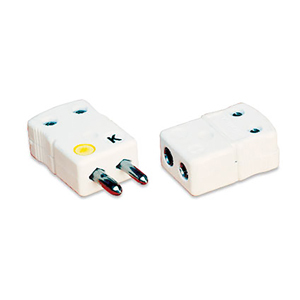 NHXH connectors are permanently dot-coded to conform to ANSI standards. For applications such as high vacuum furnaces where contamination would adversely affect the process, UHXH connectors are shipped with a removable coded dot. Temperature is limited only by the hardware. CHROMEGA™ -ALOMEGA™ , Iron-Constantan and CHROMEGA™ -Constantan alloys can be used at temperatures up to 650°C (1200°F) and Copper-Constantan can be used accurately over its entire calibration range of 390°C (750°F). Noble metal calibrations are limited by the compensating alloys to ambient use of 260°C (500°F). No damage will be done by exposure to higher temperatures, but accuracies may exceed limits of error if a temperature gradient exists across the connector. OMEGA™ NHX Ceramic Connectors are permanently color-dot coded to conform to ANSI and OMEGA standards. The one-piece body construction minimizes loose hardware. OMEGA™ UHX Ceramic Connectors are identical to the NHX models, and are also constructed to eliminate any contaminants. The UHX connector is ideally suited for applications such as high vacuum furnaces where contamination could adversely affect the process. All UHX connectors are shipped with a removable color-coding dot.. Note: Type UHXH has an unglazed/removable color dot with no ink markings, for high vacuum furnaces where contamination could affect the process. To order UHX connectors with removable color dot, change “NHX” to “UHX” in part number. *When ordering separate male or female connectors, use the suffix “M” or “F” only.